Recorded in the spellings of Helsby, Helsbie, and the dialectals Elsby, Elsbie, Elsbury, and possibly others, this is an English surname. 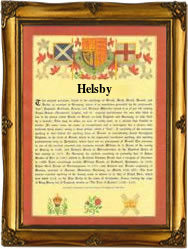 It is locational and is probably from the village name of Helsby in the county of Cheshire. It may also be topographical from residence by either a cave near a farm from the Scandanavian 'hellr' and '-bi', a farm, or perhaps from pre 7th century Olde English 'aldr-burh' meaning a hill covered with alder trees. Locational surnames names were "from" names. That is to say names that were usually given to people after they moved to another area, the easiest way to identify a stranger being to call him, or sometimes her, by the name of the place from whence they came. Spelling being at best erratic and local dialects very thick, lead to the development of alternative spellings, some far removed from the original. The first recorded spelling of the family name may be that of Agnes Helsby at the church of St Michael Bassishaw in the city of London on May 29th 1580, and later that of Henry Elsby at St James Clerkenwelll, on October 20th 1620 when he married Katherine Pellam. Surnames became necessary when governments introduced personal taxation. In England this was known as Poll Tax. Throughout the centuries, surnames in every country have continued to "develop" often leading to astonishing variants of the original spelling.